People experience facial pain for a variety of reasons. They could have a toothache. A cold sore could appear and provoke pain. You could have an injury. Sometimes a cold or a sinus infection can create experiences of facial pain. Facial pain can also be caused by a serious nerve malfunction that is known as trigeminal neuralgia. 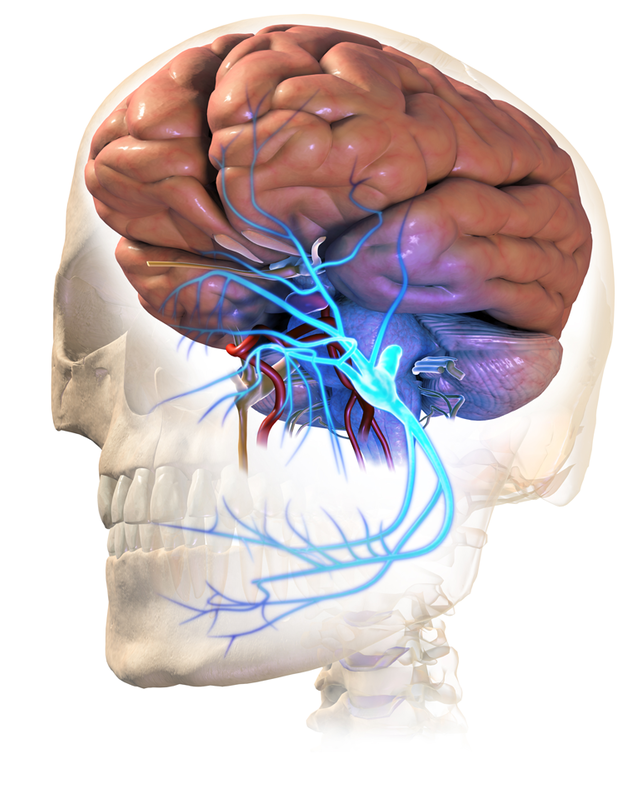 The trigeminal nerve is the nerve that connects your brain to most of your face. It runs up the side of your temple, but it has branches that connect to the lips, nose, eyes, cheeks, lower and upper jaw. When you get a fat lip, the pain travels through your trigeminal nerve. Neuralgia refers to a nerve that is sending pain signals to your brain. It is the word commonly used by physicians to describe a sharp, shooting pain. Before we look into trigeminal neuralgia, we should address a very critical sidebar. Sometimes facial pain is experienced along with tightness in the chest, a painful cramping in the torso and shooting pains in the arms, legs, and back. Facial pain, in other words, could be the sign of a heart attack. If you are experiencing these symptoms, call an ambulance or find someone quickly to drive you to an emergency room. You should not drive yourself if you are experiencing a heart attack, because you could endanger other lives if the infarction is strong enough. Trigeminal neuralgia is considered an atypical facial pain, as it comes from a source that is not immediately obvious. However, trigeminal neuralgia is often described as one of the most painful conditions known to medical science. The pain from trigeminal neuralgia can come in repeated sharp, hot jabbing pains that zap through your face very quickly. It can come in bursts, like flashes of electricity in a quick volley that lasts a few minutes. However, it can also establish itself and be painful for several hours at a time. The pain is often not constant because the pain comes from a malfunctioning nerve near the brain stem. A blood vessel is the culprit. The blood vessel presses on the nerve to the point that the myelin sheath that insulates that nerve deteriorates. This is the cause of the problem. One metaphor that can be used is a wire with poor insulation that is shorting out. Sometimes it sparks. Sometimes the short causes a long burst of rogue electricity. Sometimes the condition persists for hours. At other times, it flares up in a rapid sputtering fashion. The pain of trigeminal neuralgia is frequently addressed with over-the-counter and prescription pain relief medication. There is a possibility that sufferers can find relief through a technical intervention called neural modulation. This technique is proving to relieve pain in a variety of conditions from lower back pain to migraines. Neuromodulation involves placing electrodes strategically near nerve cells. A high-frequency pulse (10 kHz) is sent through the electrodes. The pulse does not affect the pain, but it disrupts communication between nerve cells. This interrupts some of the pain signals from traveling to your brain. In this manner, the sufferer perceives less pain. The traditional surgery for trigeminal neuralgia is called microvascular decompression surgery. This surgery if not always effective, but one major hospital reports the procedure is very successful with 82 percent of those who elect this option. The procedure provides 16 percent of those who undergo this option with partial relief.